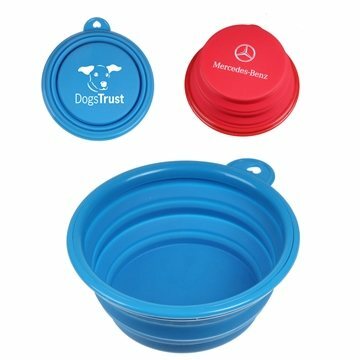 Keep your pet hydrated with this 12 oz collapsible silicone bowl. Great for travelers with dogs, cats or any pet that will need a drink on the go. This handy pet care promo is made for traveling convenience in that it can be easy flattened and stored in the tightest of spaces. At full size, it will hold more than enough water to satisfy any pet's needs. Customize with your company logo printed on the bottom of the bowl. Price and quality are excellent. Great item to have our name on, and great service by AnyPromo. Imprint hasn't cracked or altered. Great quality - just what we needed. they printed the logo on two sides and it was great quality Very easy to order with AnyPromo. We gave these away during the county fair and it was a hit among the kids and moms. Everyone had their own idea on what they would be using them for.